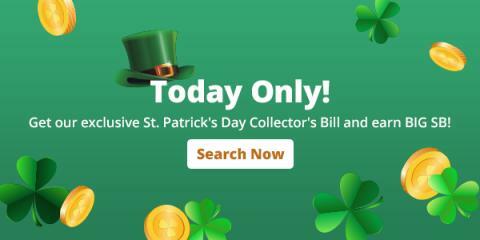 In honor of St. Patrick's Day, Swagbucks has a one-day-only Collector's Bill worth 17 SB. You can get it randomly from Search, and if you get it, you'll also get an additional 20 SB bonus! It'll be available all day today (Friday). If you're not a member of Swagbucks yet, you can create your account now and earn points called SB for doing things like searching the web, shopping, answering surveys, discovering deals, and watching videos! You can then take those points and turn them into gift cards from Amazon, Walmart, Starbucks, Target, PayPal, or hundreds of other retailers. I signed up to Swagbucks way back in 2010 - and have earned 318,685 SBs so far! I have exchanged these SBs for Amazon gift cards and Paypal - for gifts, paid bills and personal purchases. Right now I have almost enough for my second $25 Amazon gift card this month - makes shopping on Amazon so much fun! So why not get started today! ?